Hi everyone! There’s only three comics left in this year! Also, coincidentally, the last comic of 2017 will be our 100th comic! 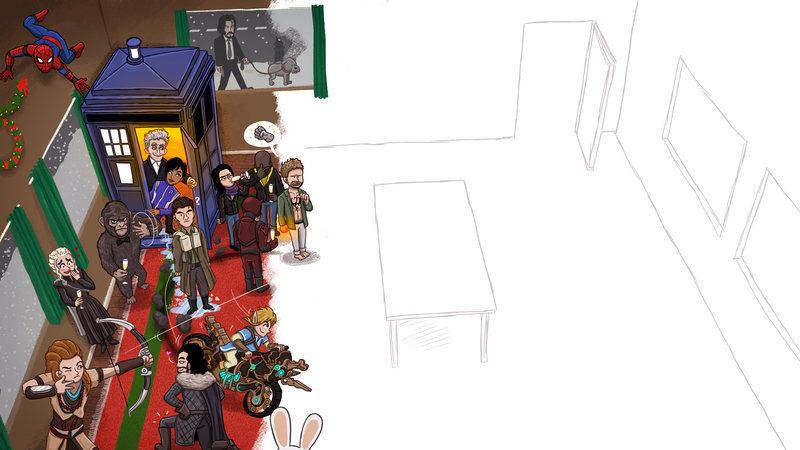 To celebrate this, and the all the awesomeness that 2017 had to offer, we’re making one massive piece of art, depicting a New Year’s party with all the major characters from shows, movies and games that were released this year. We want to involve YOU in this process though. Currently, the piece is about 30% done. Tell us which characters you want to see at the Big 2017 Pop Culture Party and we’ll do our best to include them in the next two weeks! There’s only one requirement: the character has to be from a tv show/movie/game that was released (or renewed) in 2017! Also, it’s a pretty prestigious party so don’t count on characters from an obscure anime making the cut. Once it’s done, we’ll export a 4k version so you can use it as a desktop wallpaper. Let us know who you want to see via Patreon, Facebook, Twitter or Instagram!